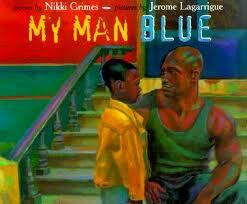 This picture book by Nikki Grimes, was illustrated by Jerome Lagarrigue in acrylics. While it is written in poetry form, and each poem can stand alone, the book really tells a story about a boy, Damon, who eventually accepts his mom’s “old friend.” Together, they face a class bully, anger, fear, and trust. 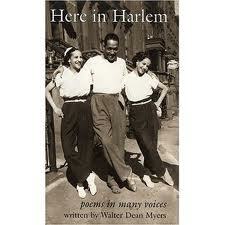 In this tribute to W. B. Yeats, Walter Dean Myers captures a vignette of Harlem. Through 54 poems, Myers introduces the different people that made up the community of his childhood home, and gives voice to each of them. Some of the people represented through poem include: a retiree, a nanny, some students, a janitor, a hairdresser, and a street vendor. This picture book by Joyce Sidman, and illustrated by Rick Allen is a picture book, a non-fiction book, and a poetry book all in one. Allen illustrated using “relief printing” which involves blocks of linoleum, ink, and in this case gouache (an intense watercolor). Sidman alternated between poetry that focuses on nature and a non-fiction explanation of the living things mentioned in the poem. 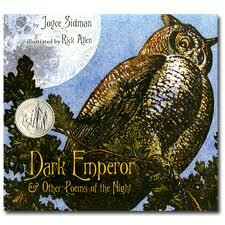 Photography by Jane Yolen’s son, Jason Stemple, is highlighted in this book. Yolen wrote 13 poems to go along with, and inspired by, the photography. The style of each poem varies, but the topic is the same: they are all about snow.